Silver Spring Networks has taken the lead in U.S. smart meter networking, but if the startup has its way, those meters will just be a jumping-off point to smart thermostats, solar panels, batteries, grid controls and the other endpoints of the smart grid. That grid doesn’t exist yet, but now Silver Spring has a chance to prove whether it can network one on a miniature scale -- on the 727-square-mile island of Maui. Think of it as a test case for some of the business cases that form the foundation of Silver Spring’s plans for a $150 million IPO, which may be the longest-awaited public offering in smart grid history. In a Tuesday interview, Silver Spring SVP Eric Dresselhuys laid out that vision as “touching the whole value chain” of smart grid improvements envisioned in Maui, from matching home energy usage with small-scale solar and wind power to balancing grid power flow with energy storage devices and distribution automation gear. With the vast majority of its revenues coming from a few big smart meter deployments, Silver Spring will be eager to expand its lines of business as it plans to go public. 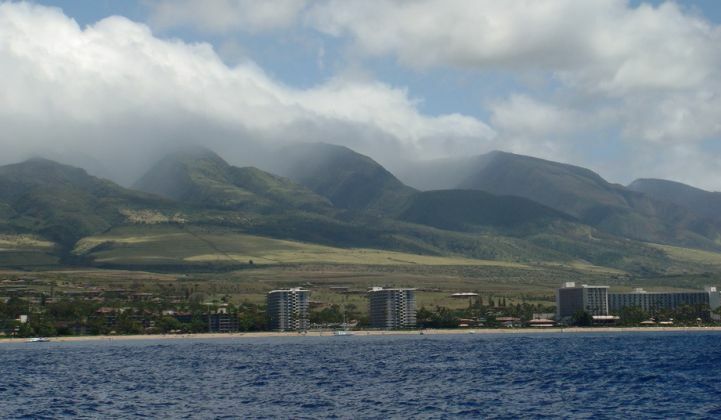 There’s no doubt that Maui provides an interesting, if unusual, challenge for smart grid planners. About 90 percent of the island’s 232 megawatts of “firm generation” comes from burning diesel fuel shipped in by tankers at a cost that makes Hawaiian power rates among the highest in the world. That’s driven lots of renewable power projects on the island, including a 30-megawatt wind farm and 6.5 megawatts of rooftop solar power, all adding up to about 20 percent of the island’s power. More renewable power projects on the drawing board are set to increase that to a whopping 50 percent by 2013, putting Maui up there with Denmark in terms of its leading share of clean energy. But managing all that intermittent power on a grid that can’t rely on outside resources to balance it will be quite a challenge. Dresselhuys didn’t give many specifics on what companies Silver Spring would be partnering with on the Maui project, just as he didn’t have much (or anything) to say about the Redwood City, Calif.-based company’s impending IPO. The Maui Smart Grid project, as the Department of Energy-funded project is called, has also made few specific public pronouncements about Silver Spring’s role, beyond asking 200 residents to volunteer to test smart meters, energy data websites and in-home technology. Enphase. The world market-leader in microinverters is also a partner with Silver Spring on a new “metering and management solution” it launched last month. Simply put, Enphase has networked all its panel-level solar inverters to a communications gateway, and Silver Spring has designed a wireless link to connect them to the utility’s network. Clean Power Finance said it is using the combo to collect and analyze solar panel data -- the kind of project monitoring capability offered by solar developers like SunEdison and inverter makers like Power-One (via its acquisition of Fat Spaniel) and many others. So what’s the Enphase-Maui connection? Well, Raghu Belur, co-founder and VP of products at Enphase, detailed to me earlier this year how the company used its network to adapt to the island’s diesel generators, which sometimes caused grid voltage spikes that caused the inverters to trip offline -- a safety measure that ended up destabilizing the grid. “We were able to reconfigure all those inverters at the push of a button” to ride through the spikes and help support the grid, Belur said. Inverters are rather versatile when it comes to turning rooftop solar from a destabilizing to a stabilizing source of power, if they can only be coordinated or controlled. While Enphase and Silver Spring haven’t announced any projects on Maui, I wouldn’t be surprised if they’re talking about it. International Battery. This Allentown, Pa.-based battery manufacturer has already hooked up with Silver Spring in utility AEP’s 2-megawatt backyard battery pilot. The project, funded by a $75 million DOE grant, will install 80 25-kilowatt batteries (International Battery is one of three battery suppliers) and control them using Silver Spring’s network, mainly to back up homes during power outages. As for Maui, International Battery has one 16-kilowatt-hour battery hooked up to a community center’s 12-kilowatt solar array, meant to help balance its solar-grid power mix. That’s a small project, but David McShane, the company’s executive vice president of business development and engineering, told me earlier this week that a 1-megawatt project with partner HNU Energy is on the drawing boards -- and HNU Energy is a partner on the Maui Smart Grid project. General Electric. GE has been working on the Maui Smart Grid project since 2009, when it launched a project to install energy management systems in the resort town of Wailea. Silver Spring is now seeking its 200 home energy system volunteers from the Kihei area, about six miles up the coast. GE is also involved in that project, Dresselhuys said, though he wouldn’t give more details. There are a couple of possibilities, however. First and most obvious would be to see GE meters embedded with Silver Spring networking technology -- and GE happens to be the brand of meter pictured on the Maui Smart Grid website, though that’s only circumstantial evidence. Beyond the meter, Silver Spring has been working on using its networks to manage distribution sensors and controls from a host of kings in the grid field, including Siemens, ABB and GE. Notably, Silver Spring is also working closely with Sentient Energy, a distribution grid monitoring tech startup that was one of the 12 startups to win a GE Ecomagination Challenge grant last year. Sentient’s line monitor devices are built with Silver Spring communications inside and they can “integrate seamlessly with any Silver Spring AMI or Distribution Automation network,” according to the company’s website. The two companies also share a common investor in Foundation Capital. Whether there’s any Maui connection, I don’t know, but I’m certainly curious to find out.